Optimise the work your landing pages do for your site with this handy plug-in. This application provides enhanced conversion rates and incredible levels of customisation to help you get the most out of your online marketing initiatives. Typically, when visitors arrive at your site after clicking on an emailed link or on a pay-per-click advertisement, the first place they come to is your landing page. If this page is not optimised to accept these visitors and to drive them to convert, then your business is missing out. All of your landing pages should be fully integrated into your acquisitions funnel. This does not simply mean providing a connection between the outbound marketing channel and your commerce pages – all landing pages provide this – but rather actively encouraging the prospect’s movement towards conversion, and limiting loss in the process. This is what Thrive Themes Landing Pages can achieve for your marketing strategies. After installing the plug-in, Thrive Themes doesn’t simply give you some random templates to design your landing page with. Instead, it provides you with sets of themed templates, all of which are conversion-optimised and will enable you to develop the unique identity of your page and of your brand. Using the plug-in is simple. 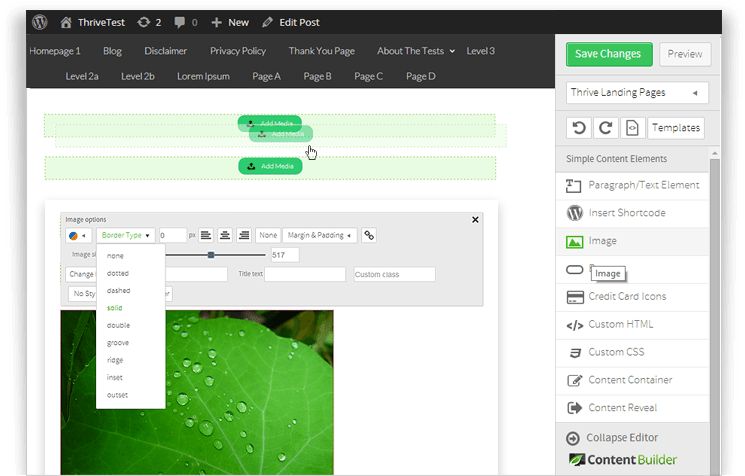 Users need only click the Thrive button on any of the pages in their content management system interface to be taken into an editing window. From here they can design and optimise their own landing pages, tailoring each specifically to the task at hand. Whichever strategies you are using to attract and convert prospects, Thrive landing pages are versatile enough to integrate directly with them. The page elements offered by Thrive’s pages include video embeds, lead generation data capture tools, feature grids, and a wide array of other additions which augment the versatility of your pages. What’s more, all of this is achieved without any complex editing software or the services of a third party. The templates are all optimised to drive conversion rates, while remaining fully-customisable to provide an end product which is unique to your site. There are currently 139 templates to choose from. These templates can then be manipulated and personalised across unlimited configurations, eliminating the need for an expensive design or development job. Thrive uses an intuitive interface which makes editing pages and then publishing them as part of your online marketing strategy easy. The plug-in enables the deployment of a wide-range of different content elements, allowing you to integrate your landing pages directly with your sales and acquisitions funnel.